This caucus aims to create a shared sense of community for black and brown leftists as we support one another in learning the history and thought of socialists of color. 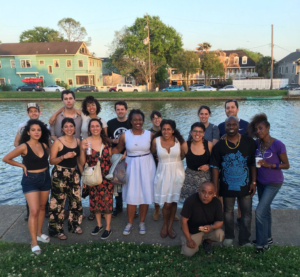 In addition to hosting happy hours, potlucks and political education forums, the caucus advocates for and develops organizers of color in the broader DSA New Orleans chapter. 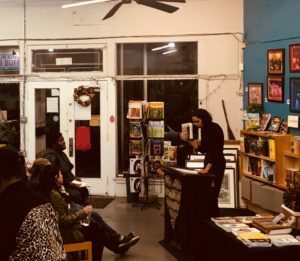 Our caucus meets monthly for a potluck and meeting at the office of WHIV.FM 2762 Orleans Ave. Get in touch for meeting dates and upcoming readings! Email socialistsofcolor@dsaneworleans.org or call (504) 444-6723 to get in touch! After taking a long break to recover from Carnival season, we hosted our first cookout along the bayou. The Socialists of Color Caucus and Political Education Committee teamed up to hold an educational forum. Our four speakers talked broadly about political struggle, past and present, of working class black and brown folks in the South. Pepper laid out how food and agriculture were at the center of oppressive Jim Crow policies, but also the seeds of autonomy and liberation for black Southerners. 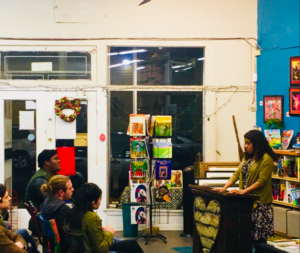 Yliana discussed the recent history of New Orleans’ charter school system, and the implications of this system for poor people, black and brown. Michael related the history and origins of the militant, black-led Sharecropper’s Union of 1930s Alabama. Sue closed with the powerful story of the Scottsboro Boys, nine black boys wrongfully convicted of a crime and threatened with lynching in Scottsboro, Alabama. The Scottsboro Boys were defended in court by the U.S. Communist Party and in the fields and streets by leftists around the world.